I had a couple of comments wondering if this was just some fantasy site — some guy wandering around photographing various Armani stores and waxing lyrical about threads and drapes. There is an element of that fantasy in this project, for sure: a degree of buying into the brand image, associating with what it personifies, and living in a slightly shifted, somewhat pretentious mental state. 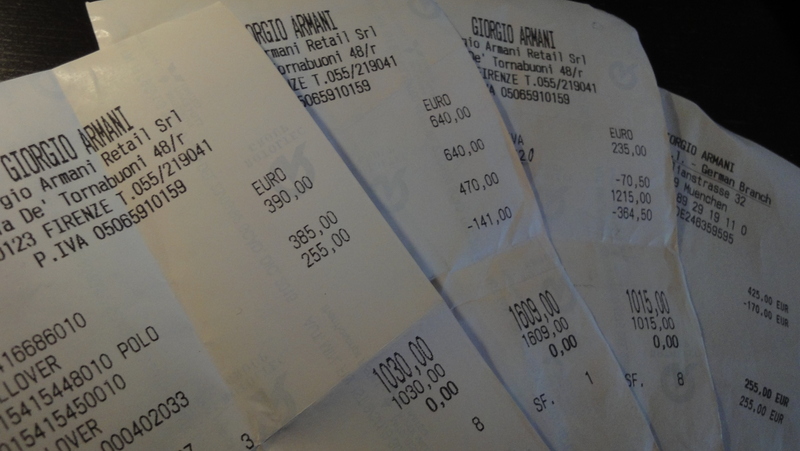 Coincidentally, these payment slips also show the variety of instant discounts you can get in the highest level of Giorgio Armani boutique, just by asking politely and fairly quietly. There are many more purchases from more recent months, also from Prada, but they spoil the symmetry of this shot — and as we now all know, how things look is more important than what they cost. 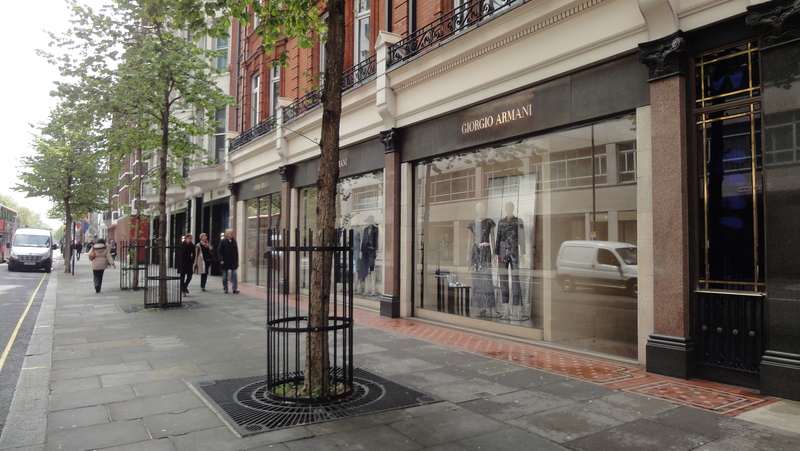 A short business trip to central London – wearing my Giorgio Armani suit, naturally – gave me a chance to visit Knightsbridge, one of the most expensive shopping areas on the planet, and Giorgio Armani’s London flagship. This large boutique is located at leafy 37 Sloane Street, slightly apart from the thronging masses visiting Harrods on the main Knightsbridge thoroughfare, but still symbiotically paired with Prada next door, and it contained a wide range of the standard items as well as the new Spring/Summer collection. Decorated in the standard beige sandstone, it is split across three levels, with men’s clothing in the basement. While trying on and asking about prices on a couple of nice tops I discovered something the sales assistant called the “private pre-sale”; the assistant gives you a call a week before the season sale officially starts, and around another 10% off even the sale prices if you come in early. It’s just another way of rewarding repeat customers, and when the sleek cardigan I was tempted by costs £695, that makes a real difference. I also discovered the strikingly great fit of an Armani cardigan, the name of which does not do the product justice. Calling that garment a “cardigan” is like calling Giselle Bündchen a housewife: technically that may be accurate, but it does not capture the true beauty of what you are looking at.